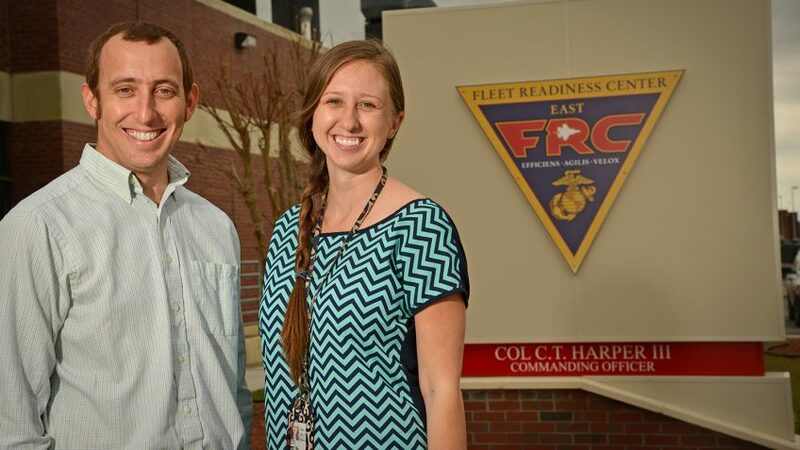 NC State alumni Ramsey Davis and Holly Tucker earned their engineering degrees from the 2+2 site-based engineering program in Havelock, North Carolina. NC State’s College of Engineering created a site-based 2+2 engineering program in Havelock, North Carolina, in partnership with Craven Community College and US Navy Naval Air Systems Command (NAVAIR). The goal of the program is to provide students in Eastern North Carolina with the opportunity to earn an engineering degree from NC State without having to move to Raleigh. The site-based program has proven to be instrumental to the success of many NC State students and alumni, including Holly Tucker and Ramsey Davis. NC State Alumna Holly Tucker grew up in Swansboro, N.C., near three Marine Corps bases, Cherry Point, Camp Lejeune and Marine Corps Air Station New River. For as long as she can remember, she’s always been interested in aircraft. Tucker is also a third-generation NC State engineering graduate. “I always strived to obtain my engineering degree from NC State, following in my father, grandfather and uncle’s footsteps,” she said. 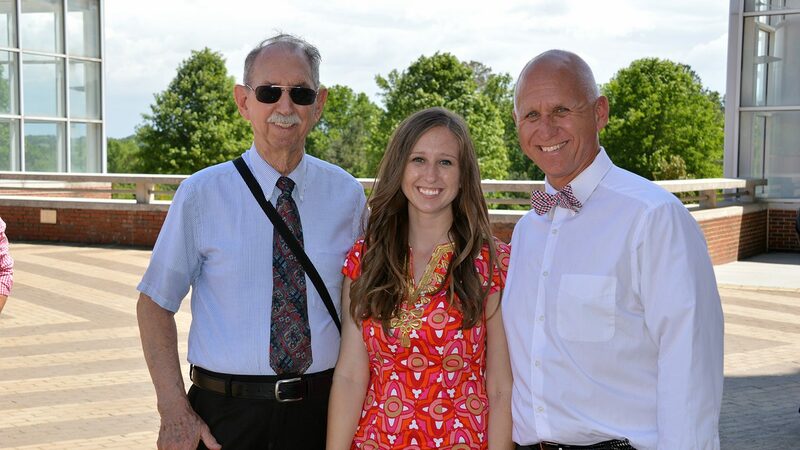 Holly Tucker pictured with her grandfather, Henry Tucker, Jr., and father, Henry Tucker III. Her father, Henry Tucker III, earned his Aerospace Engineering Degree in 1985 and her grandfather, Henry Tucker, Jr., earned his Mechanical Engineering degree in 1959. Her uncle also earned his engineering degree from NC State. Tucker’s grandfather served as an Air Force pilot while her father’s career path brought him to Naval Air Systems Command (NAVAIR), located at Marine Corps Air Station Cherry Point in Havelock. “I always wanted to be able to do my part for the military and becoming an engineer for the Navy, supporting the Naval and Marine aircraft was, in my opinion, the best way for me to do so,” Tucker explained. Tucker started her education at NC State’s Raleigh campus, but during her sophomore year she left, putting her educational goals on hold. Tucker earned her bachelor’s degree in engineering in 2015. “It was the best situation possible for me and I am extremely grateful to have had this opportunity to follow my dreams,” she said. Ramsey Davis wasn’t quite ready for college at the age of 18. “I was 28 when I decided to look into finishing my NC State engineering degree,” he said. Now married and with a family, moving to Raleigh to finish his degree was not an option. 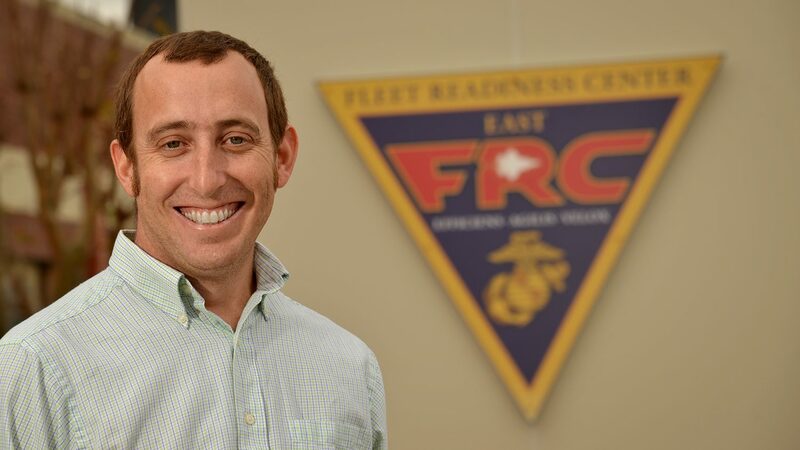 “The Havelock program allowed me to continue living in Eastern North Carolina, support my family and still finish my engineering degree,” Davis explained. He said the program, coupled with NAVAIR, provided real-world experience in the engineering industry while still a student. Davis praised many of the NC State professors who went out of their way to provide online office hours to ensure the Havelock-based students were gaining the same understanding of the course materials. “I can say that I truly felt like all of the NC State professors that I studied under while attending online classes were fully invested in my future and success,” Davis said. NC State Engineering alumnus Ramsey Davis. Without this site-based program in Havelock, Davis said he would never have earned his engineering degree from NC State, which he did in 2015. He added without this program, the financial struggles of raising a family would have potentially been overwhelming. “Having an engineering degree in Eastern N.C. opens job opportunities that are far and few between for this area,” he explained. Are you interested in earning an online degree from NC State’s College of Engineering? Visit NC State Engineering Online’s website for program information and application deadlines.